What is included with your Sandals Reservation? All Sandals Resorts are all inclusive resorts including all meals, drinks, land/water sports, entertainment, roundtrip airport transfers, basic wedding/honeymoon package, tips/gratuities, and all taxes. Up to 15 restaurants per Sandals resort are included with no surcharges or restrictions. Enjoy meals and anytime snacks at your desire. Most restaurants do not require reservations. Dress code varies from resort elegant to casual. Restaurants are themed based featuring chefs from around the world with at least one authentic island cuisine restaurant at each resort. Room service offered in specifies accommodations and 24-hour room service in all butler suite categories. Enjoy fine wines and premium brand drinks at up to 12 bars and lounges at each Sandals Resort. Sandals features specialty bars and lounges including swim-up bars, piano bars, martini bars, authentic British pubs, and more. Butler and Club Sandals rooms include complimentary in-room bar stocked daily with beers, wines, and liquors. All Sandals room categories are also stocked with complimentary juices, bottled water, and sodas. All Sandals accommodations are luxuriously designed with such inclusions as 4-poster mahogany beds, stylish tiling, and marbled baths. Luxury furnishing even within the standard entry level deluxe category rooms. Of course Sandals is well known for such accommodations as sensational beach front luxury villas, cliffside millionaire suites, villas with private pools, swim-up rooms, and luxury accommodations to fit anybody's taste and style. Sandals sets itself apart from other resorts featuring world-class 46ft Newton Dive Boats, PADI certified divers & instructors, and free scuba dives for guests. All boats have onboard restrooms, showers, air tank storage, platforms to enter water, drop down steps for easy boat access, exclusive decompression bars at 15ft and more. Up to 2 dives per day are allocated for certified divers and 1 dive per day for anybody wishing to become resort certified. 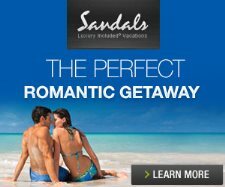 Sandals resorts have training scuba pools and offer resort certification 2 hour scuba class at minimal charge of $70, all equipment provided by the resort. Liquid image masks available for rent to record underwater experience at several resort dive centers including La Toc, Montego Bay, and others to come. Sandals resorts also have snorkeling boats to take you out to the reefs for the best of Caribbean snorkeling. Sandals Resorts also features a full array of complimentary catamarans, kayaks, hobie cats, hydrobikes, glass bottom boats*, windsurfing, and waterskiing**. Enjoy 18-hole golf courses at Sandals Emerald Bay and Sandals Grande Riviera. Sandals La Toc St. Lucia has a 9-hole golf course which is also available to the other 2 St. Lucia resorts minutes away. Green fees are complimentary, additional charges for caddies and rentals, see links below for more information. All resorts have air conditioned fitness center and exercise programs. Enjoy an array of land sports including day/night tennis, squash/ racquetball*, basketball, volleyball, pool tables, rock climbing wall**, shuffleboard, and table tennis. Sandals Resorts provides the best of nightly entertainment including elegant piano bars, theme parties, beach bonfires, dancing, live shows, steel drum bands, talent nights, Caribbean Night, local island performers, special functions such as wine tastings, cocktail parties, karaoke, and staff/guest talent shows. All Sandals Jamaica resorts have full exchange privileges with each other, however Sandals only provides transportations for resorts within the same Jamaica town. The 3 Montego Bay resorts offers shuttle connections - Sandals Montego Bay, Sandals Carlyle, and Sandals Royal Caribbean. The 3 Sandals St. Lucia resorts have full shuttle exchange coverage provided - Sandals Grande St. Lucia, Sandals La Toc St. Lucian, and Sandals Halcyon. Sandals Resorts provides free wedding ceremonies on various resort locations including beach weddings. Honeymooners enjoy the complimentary honeymoon package. Your Sandals Resort cost is your final cost, no hidden charges. Whether you book flights through Sandals or on your own, roundtrip airport transfers are included. Unlike most other resort brands, tipping is not allowed at any of the Sandals resorts, gratuities are totally included. In addition, your cost includes all resort taxes and surcharges. World class Red Lane Spas are featured at Sandals Resorts. Enjoy the popular couples massage or a full array of massage and body treatment services. Spa services are available at additional cost. At times, some promotions will include such items as spa credits for certain room accommodation categories.